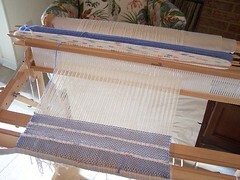 Posted on April 5, 2009	by Linda S.
These are cotton warp, Sugar and CreamCotton weft. This is the first time I have tried to do the floats but they seem to be doing fine. The floats are the white/multi lines. That weft floats across 3 of the warp threads. It’s much easier to set than I thought it would be. I had always thought that would mean using the pickup stick every time you wanted to put in a float. It does not. The pickup stick is actually inserted once, then it is left lying flat and pushed up against the back bar until the next time a float is needed for the pattern. How cool is that! I have yet to wash anything I have woven with the Sugar and Cream. These will be the first. I think they will probably shrink terribly. I don’t know about the colorfastness of the blue, but have read on one of my weaving group forums that the colors of Sugar and Creamby Lily will run and fade terribly…so don’t know what will happen with the white/multi floats… but light blue would not be so bad…;o) Anyway…will let you know when I wash them. 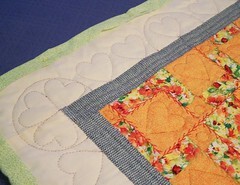 This entry was posted in Crafts, Embroidery, Handcraft, Handwork, Needlework, Quilt, Sewing, Weaving. Bookmark the permalink. I have both woven and knitted with Sugar ‘n Cream, and, yes there is some shrinkage, but not as much as you would think, and I have never had color run problems. A baby blanket I knit had intarsia hearts in lavender, pink, blue, yellow and green in a while background. I washed it like the mama would – hot water – and dried it in the dryer. The white was white all through and the colors still clear. And it was incredibly soft!! !